Director Chris Wedge has animated background. Not so much in saying in his personal life, but rather in his previous work as a director of animated movies. After directing two short films (Tuber’s Two-Step and Balloon Guy), Wedge directed the cartoon short titled Bunny and won an academy award for best animated short film. After that, Wedge help co-found the animation studio Blue Sky Studio and is the Vice President of Creative Development there. Being a value component to the team, Wedge lent his hand to several animated feature films to Blue Sky, this includes their first theatrical release 2002’s Ice Age as well as 2005’s Robots and 2013’s Epic. Now, making the jump from animation to live-action, director Chris Wedge, Paramount Pictures, and Nickelodeon Movies present the family feature film Monster Trucks. Is Wedge’s first live-action debut worth seeing or is it just a monster mess? Stuck in a small North Dakota town (and going nowhere), Tripp Coley (Lucas Till) is a high school senior who dreams of leaving his mundane life, clashing with his mother Cindy (Amy Ryan) and her new boyfriend Sheriff Rick (Barry Pepper). Keeping the small community afloat is an energy oil company run by Reece Tenneson (Rob Lowe), which is about to hit a major oil deposit, drilling through a layer of water caverns that’s home to some unknown sea dwelling creatures. When these monsters make their way to the surface (due to the drilling), Reece and head scientist Dr. Dowd (Thomas Lennon) capture two of the creatures, while the third makes his escape, finding his way to Tripp, who works in junkyard. After the initial shock of the pair meeting, Tripp, and the tentacled sea creature blob that he names Creech, slowly become friends, finding a hiding spot for the beast inside his beat-up dream truck and using its natural power to drive the vehicle around. Soon joined by fellow classmate / biology tutor Meredith (Jane Levy), Tripp soon realizes the threat the oil company poses to the town, working to stop Reece and his thug henchman Mr. Burke (Holt McCallany) and rescue’s Creech’s brethren, returning them to the deep. It was kind of interesting to hear about Chris Wedge being a co-founder of Blue Sky Studios (I did my research on that). As for his movies, I did like the first Ice Age (probably the best in the long running franchise), Robots I thought was funny and creative, and Epic, despite it feeling like “Ferngully 2.0”, was visually beautiful and pretty okay animated tale. Also, in case you didn’t know, Chris Wedge is also the voice behind the beloved Ice Age character Scrat. So, suffice to say, that Wedge has an understanding with animated feature films and / or kids’ movies, which (I assume) one of the reasons why he made the jump to live-action with the movie Monster Trucks. I remember first hearing about this movie when I saw the trailer for it. I’m not going to lie, my initial reaction to the trailer was bad…like WTF am I watching! However, despite my low expectations for this movie, I decided to take a chance and go see Monster Trucks (you know…one for the team, so you guys don’t have to). And yes, after seeing the movie, my expectations were right as Monster Trucks just simply predictable, haphazard dull, and not much in entertainment. 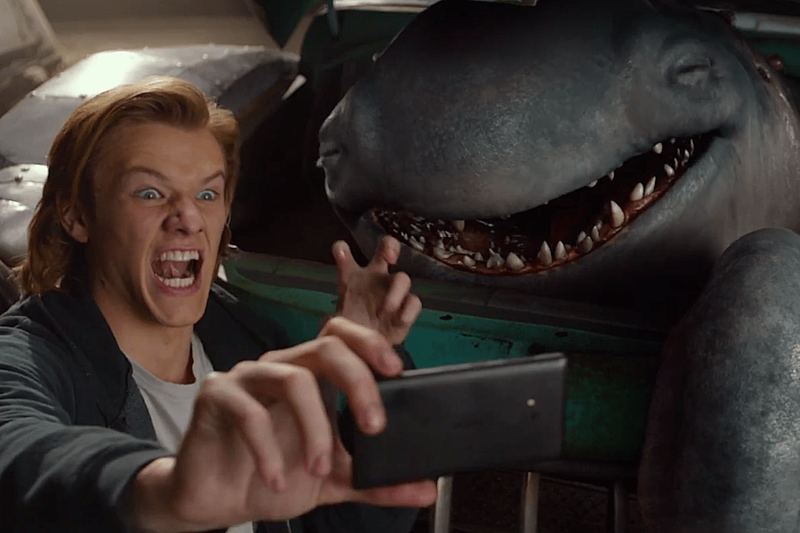 At its core, Monster Trucks is a kids’ movie, pandering to that younger tween age in its story, humor, and overall premise as the film itself doesn’t take itself too seriously when presenting the tale of Tripp and Creech. Thus, that particular age group will find this movie enjoyable (and probably like it). Heck, if this movie was released back in 1991 or 1992 (when I was 7 or 8), I would definitely be begging my parents to take me to see this movie. In truth, it has the all the makings of Disney-eque family film (i.e. a young boy longing to leave his small hometown, an evil corporate villain who is out to make a profit, and a loveable creature who ultimately befriends the young boy). Throw in a love interest, evil henchmen, and some chase scenes, you have it all. Of course, the big catch to the movie is trucks, finding Creech gelatinous form to squeeze inside the guts of an engine-free truck to take control of the vehicle for some kid-friendly adventures on-screen. Speaking of Creech, the visual effects for the creature are pretty good. It’s nothing revolutionary in design or visual effects, but it’s still pleasing to eye and it’s hard not fall in love with Creech’s adorable blubbery face. As for the filmmaking aesthetic, it’s pretty standard, which not good nor bad, just middle of the road. There’s plenty of set pieces that simulate the small rural town in the heartland of the US and there’s a big action-chase finale that keeps up with the film’s kid oriented direction (i.e. plenty of kid-glove thrills with some humorous bits). Unfortunately, to the adult-crowd, Monster Trucks becomes a bore right from the get-go, feeling more like a TV movie fit for Cartoon Network or ABC Family. First and foremost is the ridiculous plot of the movie, which personally seems a bit stupid and a bit absurd. In conjunction with that idea, the way how the story unfolds is nothing new or original, which makes Monster Trucks highly predictable from where it goes to where it ultimately ends up. Basically, in my opinion, the movie is combination of Legend of the Water Horse and Herbie with a splash of E.T. and Transformers. All of those are good movies, but Monster Trucks feels like a cobbled version of them, picking and choosing certain aspects for them, only to find them to a lesser degree in Wedge’s film. In addition, Wedge along with screenplay writer Derek Connolly meander through several side-stories through the movie, finding Tripp conflicted with parental figures from his deadbeat / flunky father (Wade Coley) and his mom’s new boyfriend (Sheriff Rick), to a finding a high school romance between Tripp and Meredith, and Dr. Dowd’s discovery of the creatures having a hive-mind communication mentality. These are really interesting ideas / sub-plots, but they’re never really fully examined in the movie, with these narrative threads getting lost along the way or just simply unfinished by the film’s end. Lastly, the film’s comedy has its moments of levity, but most jokes fail to hit their target. Perhaps this is the reason why the movie has been delayed for some time…. like almost three years. Principle photography was in 2014, with a set release date of May 2015. The movie was then pushed back to December 2015 and then again to March 2016 and the one finally time to January 2017 (this of course is the US release date). In addition, the movie has a very large production price tag attached to it, roughly $120 million. I know…what! That’s a lot…that’s almost the budget bracket for a standard big studio blockbuster film. So, you can easily see why Paramount Pictures pushed the release date back for Monster Trucks. Learning all that, I’m surprised that the studio decided to release the movie altogether. Monster Trucks finds its cast with plenty of familiar faces, starting with its central hero character of the film Tripp Coley, who is played by Lucas Til. Known for his roles in the recent X-Men movies (First Class, Days of Future Past, and Apocalypse) as well as in the recent TV show reboot MacGyver, Til handles his part well as Tripp, a character who is written in broad fashion of being a central protagonist. The role doesn’t require him to be theatrically dramatic, but Til doesn’t overact in the part of Tripp, playing to the tone of the movie. Thus, Lucas Til’s portrayal of Tripp is just fine for what Monster Trucks needs. It’s not “out of this world” spectacular nor is it deplorable in bad acting. That being said, his performance of Tripp won’t be his define character in his Til’s acting career. In terms of supporting characters, Monster Trucks has plenty of recognizable actors in its cast (probably one of the reasons why the production budget was so high). These actors, while not A-list stars in the current Hollywood echelon are well-known in various other TV / film projects, which makes their appearances enjoyable, but also begs the question on why their wasting their talents on such a bad movie. 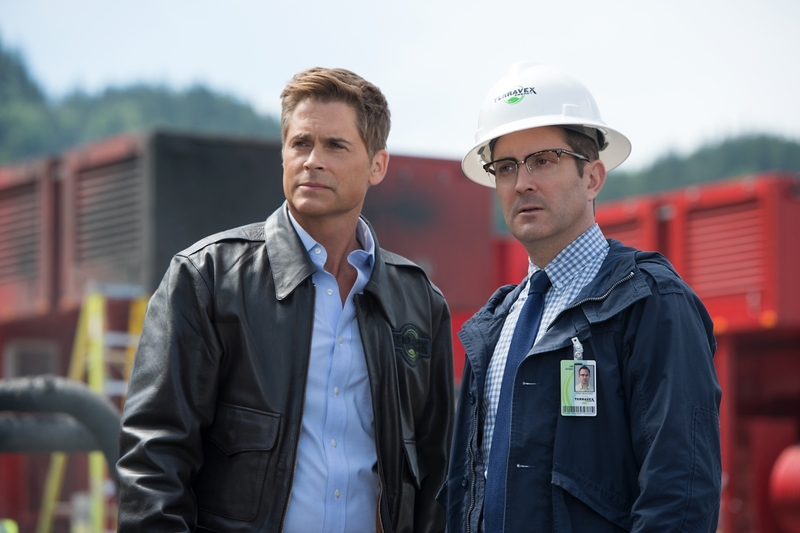 Perhaps the best two supporting roles In Monster Trucks are from actors Thomas Lennon and Holt McCallany. Lennon does bring an all-around goofy / comedic performance in his previous work and so does in Monster Trucks as the character of Dr. Jim Dowd, bringing some of the more “on-point” laughs in the film. As for Holt McCallany, he looks the parts, acts the part, talks the talk of the cliché architype character of a thug henchmen. So, while the character of Mr. Burke isn’t new, McCallany does a good job in easily filling that position. The movie also has several throwaway roles from Danny Glover’s Mr. Weathers, Tripp’s paraplegic boss who runs the junkyard (however, in one scene, he can drive a normal truck? Kind of strange? ), to Rob Lowe’s cartoon-ish villain in Recce Tenneson (its kind hard to take Lowe as a bad guy), to Barry Pepper’s (yes, the cool sniper from Saving Private Ryan) character of Sheriff Rick, a character who doesn’t seem to fit properly in the movie. The rest of the cast includes, Jane Levy as Tripp’s love interest Meredith, which really feels shoehorned into the movie and manufactured than organic, Frank Whaley as Tripp’s flunk dad Wade Coley (again this storyline doesn’t go nowhere and serves to further plot beats), and Amy Ryan as Tripp’s mother Cindy Coley (Ryan basically only has two small scenes in the movie. Why even include character in the movie?). Again, their appearances are welcomed, but I’ve seeing each one in better roles and in better movies. Tripp hits the road with the sea-like creature Creech in the movie Monster Trucks. Director Chris Wedge’s first live-action movie has its mark on its intended demographic, lathering up kid filled laughs and gags for the juice box crowd. Unfortunately, with cartoon-ish like characters, unfulfilled side plots, a ridiculous concept, and poorly written script, Monster Trucks is far from being a great movie, despite its recognizable cast. Personally, it was pretty humdrum kids’ movie. I had low expectations walking into this movie and even those expectations were only half-met. Some parts were okay, some parts bad, but the end result just left a bad taste in my mouth. It’s not really worth seeing in theaters (unless you have little kids) and just skipping it is the best option (or just wait until it comes to one of the main TV channels). All in all, Monster Trucks hits in intended target audience (young kids ages 7-9 will probably like it), but that’s pretty much it, failing to connect to a larger audience and already projected to be the first box office bomb of 2017. There’s not much “under the hood” in Monster Trucks. I know right….that insane for a movie such as this! Didn’t make it’s way to my theater. I’m fine with that. Haha…yeah. Its really not worth seeing in theaters. Thanks for the comment! Haha…thank you. I took one for the team of movie blogger out there. Thanks for the comment!